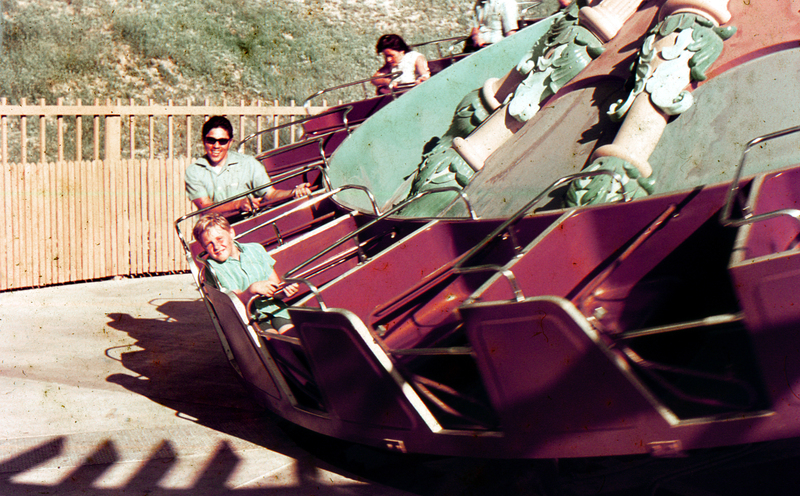 Amateur/visitor photograph (Agfachrome color transparency) of the original Circus Wheel ride at Magic Mountain, ~1971. The original Circus Wheel was a Roman-themed Trabant by Chance Industries. It spun clockwise and tilted. It was replaced by a Tilt-A-Whirl that was also called Circus Wheel and had various other names. LW2754a: 19200 dpi jpeg from color transparency purchased 2015 by Leon Worden.